In the series Becoming Invisible, artist Vicky Sabourin deals with humanity’s desire to have a meaningful relationship with nature. 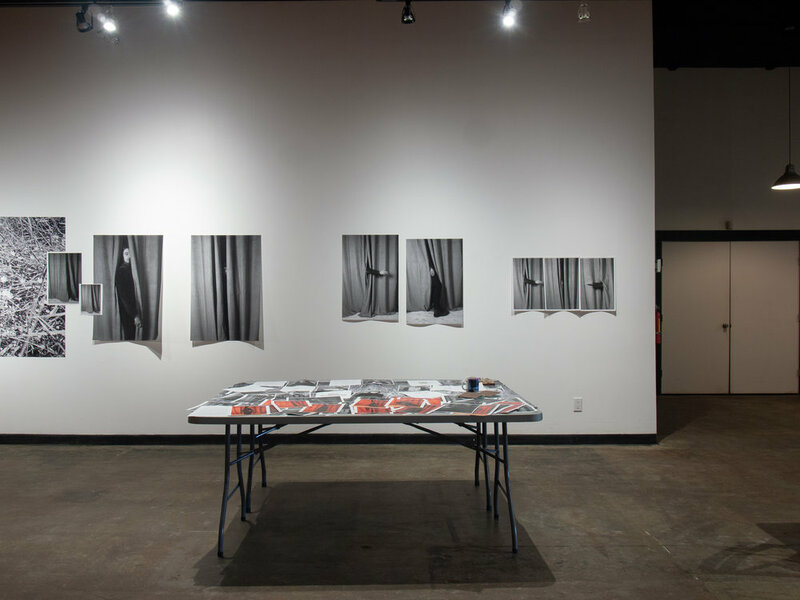 Using mixed visual media and performance, Sabourin explores the anxiety with which this desire is fraught, surrounding loss, death, and absence. There is also anxiety about the authenticity of a human’s relationship with nature, as it can never be fully reciprocated and is thus always in question. The series is divided into three separate chapters that are stand-alone pieces as well as tangentially related to one another. In each chapter, the viewer is confronted with contradictory scenarios concerning the gap between humans and animals; the kinds of relationships that occur across this existential border. In the first chapter, a video performance, Sabourin ‘tames’ a felted peregrine falcon, assuming a state of urgent not being there. The artist camouflages herself under a sheet patterned with a black and white print that is at once synthetic and organic, conjuring images of a fractal forest floor. Taming the falcon requires the human to perform invisibility, remaining impassive in the face of the animal’s fear until the bird gradually becomes aware of its own captivity. Yet, by the time the bird has been subdued, the relationship has shifted. Training an animal to serve a human ‘master’ means attempting to strip it of its instincts and bring it out of its natural environment. It is only in the moment of invisibility, when the falcon is still wild and the falconer is in a state of not being there, that there is any potential for an authentic interaction to take place. If Chapter One articulates the necessity of absence to the human/animal relationship, Chapter Two of Becoming Invisible expresses anxiety about this idea of being nowhere. The installation was originally presented as a public artwork located in the prairies just outside of Montmarte, Saskatchewan—a sprawling landscape for which the town’s name is a misnomer. 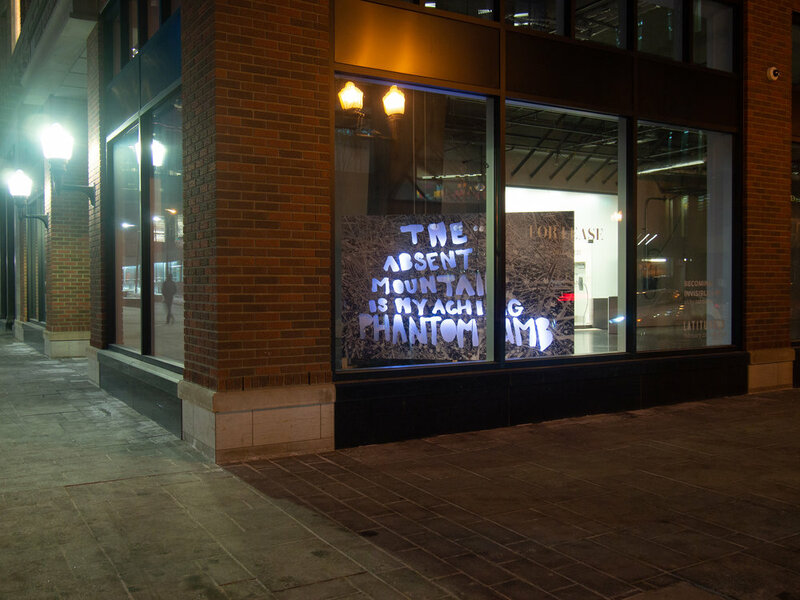 Using block letters cut from the recurring image of the forest floor, Sabourin spells out, “THE ABSENT MOUNTAIN IS MY ACHING PHANTOM LIMB” in a shape vaguely resembling a mountain’s peak. While walking in New York City just as winter was beginning to thaw, Sabourin witnessed a man in a green trench coat, walking and stopping intermittently to throw a pinecone from his pocket, over the fence and into Central Park. To pick a pinecone up from the ground, hold it, feel its ridges, its uniform shape, to understand that it contains potential futures—trees—and to place it in one’s pocket, taking it from where it has fallen and bringing it elsewhere, is to intervene in the natural order of things. As city dwellers, we can travel to the mountains or the sea in an effort to feel ‘at one with nature’, bringing home shells, branches, fallen butterflies, or decomposing skeletons as souvenirs. These tokens are trophies of a sort, objects poached from their natural habitat, proof of a brief proximity to a world never fully understood. Perhaps this state of being nowhere, the falcon not yet trained to fear its human tether, is a potential path towards a nonintrusive relationship with nature. In Chapter One, the installation features tiny porcelain replicas of ghost pipes displayed on a plinth covered with the same abstracted underbrush as seen throughout the series. These white and translucent flowers, also known as corpse plants, feed off of decaying plant matter and can thus grow in the dark. They are, to quote the artist, “gleaming manifestations of something that has or is disappearing.” Like the falconer during the first few encounters with the falcon, the ghost pipes are out of sight—invisible—but still present. Kalie Stieda is a writer, editor, translator, and aspiring polyglot living in Edmonton, Alberta. So far, she can speak fließend German, lidt Danish, and un peu de French, but is considering learning L’italiano. Her translations have been published in the Viennese magazine Streulicht, as well as in artist books put out by Sternberg Press. She has studied at Humboldt University in Berlin, and obtained her Masters in Germanic Studies from UBC in 2017, with a thesis entitled “The World Is Real: Writing, Counting, and Reading in the Art of Hanne Darboven.” Kalie is also an amateur radio host, and currently produces a weekly music program on CJSR called Elastic Chords. Sometimes, she plays the tenor saxophone.